louisgray.com: We've Gone Solar. The Data Already Shows Green Benefits. We've Gone Solar. The Data Already Shows Green Benefits. The costs of home ownership extend well beyond the mortgage and annual rites of property tax. Since buying our home in 2010, I've often mildly complained about getting "Benjamin Franklin'd to death" with all the underpinning recurring costs - from water to garbage to energy utilities - and that's not even addressing the repairs you can't just pass off to a willing landlord. 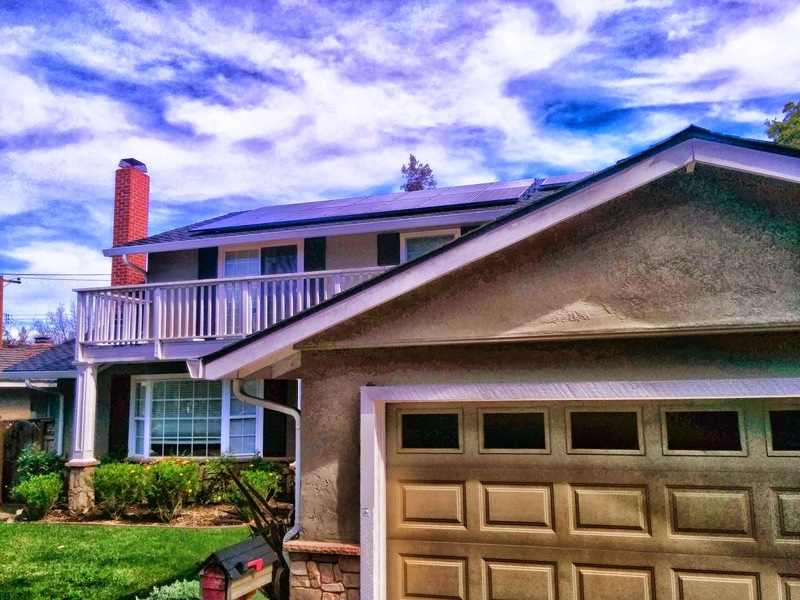 Long on our whimsical 'to do' list has been to consider going solar. We've always known it was good for the environment, to create our own energy and give it back to the power grid, but after months and months of getting notes from PG&E saying we were using well more than our unfair share of electricity, thanks to keeping three young kids warm and in clean clothes and dishes on a daily basis, I made an investment in solar - calling up Sunrun, and getting panels on our roof that will be making energy for at least the next twenty years. If you're familiar with how PG&E and other utilities do business, they start off your service at a low rate, and the more you use above average, the higher the rate goes. So if you used 2 or 3 times the amount of a typical home your size, you could be paying multiples on top of that per month. We got tired of getting these nasty notes in the mail about how we were wasteful people, and didn't feel PG&E accounted for our having three kids who just loved to get things dirty. So in comes solar and down go our costs. And just like having a Fitbit helps me measure my own habits, and the Nest thermostat has helped us reduce our energy use and track when we use our air conditioning and heating, the availability of data can quickly show us our impact. 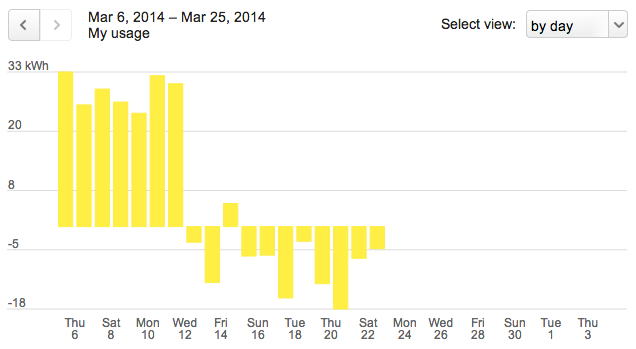 With Sunrun's solar panels tracking data to their customer portal, I can compare the energy we're creating with our PG&E history showing how much we typically use. With our panels being active just over a week's time, I can see our average kilowatt hours of energy created surpass all but our most active days from the last few months. 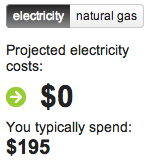 And our projected electricity bill has dropped from the average of hundreds of dollars a month to zero. 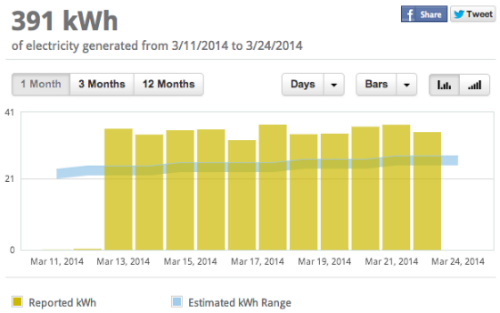 PG&E reports February rarely peaked above 35 kWh in usage. Where we once owed PG&E money, we're now making it back. 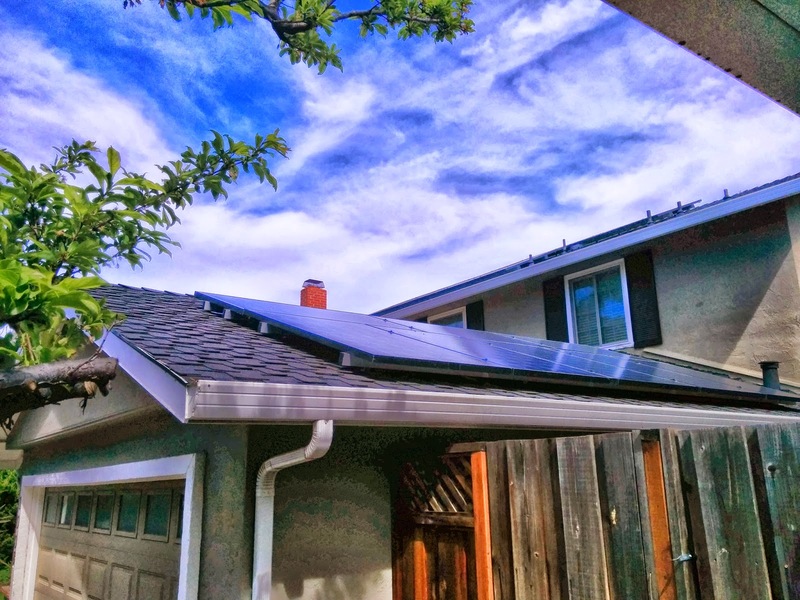 As I've gone through the process of evaluating solar and making a decision on how to invest, many people are curious to how quickly we'll make back our initial costs. What we've managed to do is take a variable bill in the low hundreds a month to a static $22 a month, keeping our line open to PG&E in the event of demand outstripping supply. And that doesn't even consider that energy costs are hardly likely to be stable over the next twenty years. Our long term calculator shows us saving more than $65,000 over the lifetime of the contract, and we should be in the black, so to speak, in five years, if not sooner. Virtually eliminating our electricity bill has the same kind of relief as you've probably felt when you pay off an existing car loan or send in the final check for a student loan. It cost you money, but now it's behind you, and the next paycheck will stretch out a little further. And if I have to admit it, the panels on top of our roof look pretty cool - it's like getting caps on your teeth to show a little bling to the neighbors. For the first time in a long time, I'm looking forward to our energy bill. Disclosures: Nest was recently acquired by Google (where I work). I bought my Nest thermostat last year and bought four Nest Protect smoke alarms earlier this year, all at full retail. Also, if I can get you to join Sunrun, I get a referral bonus. So let me know if I can get you on solar, and I can get a few bucks too.